An open-air baseball stadium located in downtown Minneapolis, Minnesota, Target Field is primarily the home of Major League Baseball’s Minnesota Twins from the American League Central Division. The Twins moved into the stadium for the start of the 2010 MLB season after playing 28 seasons at their former home, the Hubert H. Humphrey Metrodome. Target Field is the sixth ballpark that the Twins have called home, and the third in Minnesota since they moved to the Twin Cities in 1961. The stadium has also played host to a number of other teams and events other than the Twins, such as a few College basketball games and both college and professional football games have been hosted at the site, as well. 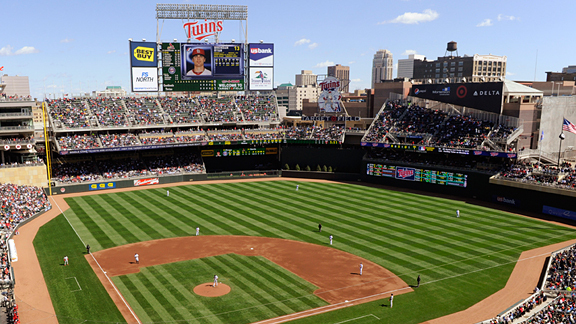 The field was the site of the 2014 Major League Baseball All-Star Game, which was the third of such games that Minnesota has hosted. • In the mid-90s the Twins introduced the idea of constructing a new home and moving away from the Metronome that they had played in for the last 28 seasons. The team settled on a site next to the Mississippi River for the construction of their new home by 1995. • Construction for the Twins’ new home took over two years with ground being broken on the project on August 30, 2007, and the opening of the stadium on January 4, 2010. • In 2001 the Twins were selected as apart of Major League Baseball’s contraction along with the Montreal Expos who were moved to Washington DC where they became the Nationals. The Twins were saved from being relocated or dissolved by a court ruling that said the Twins were contractually obligated to play at the Metrodome. • The Minneapolis-based company, Target, purchased the naming rights to the stadium on September 15, 2008 and named the stadium to Target Field. The deal funded a number of upgrades to the park and the surrounding areas.